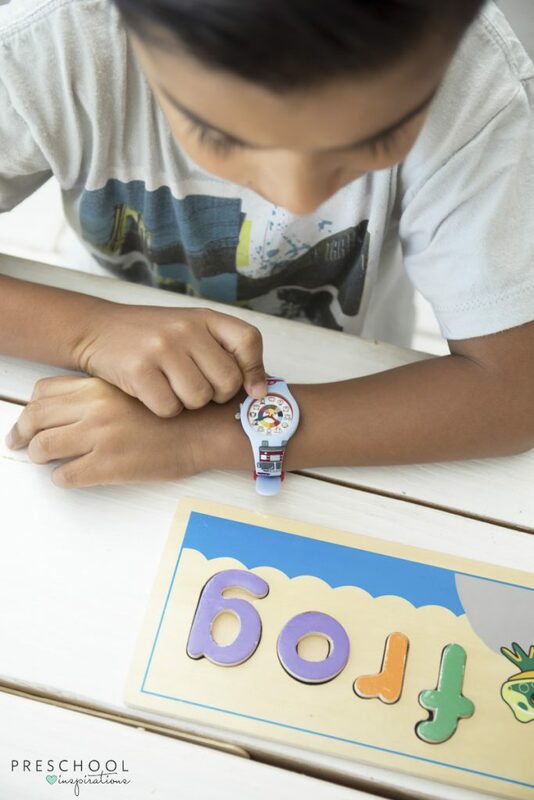 Finally, preschool and toddler watches that are made just for kids and give young children the tools needed to learn about the basic concepts of time. My three-year-old daughter has been looking at watches constantly. If we walk near a display with watches, she has to stop and look at them. At this point in her life, she is only beginning to understand time. 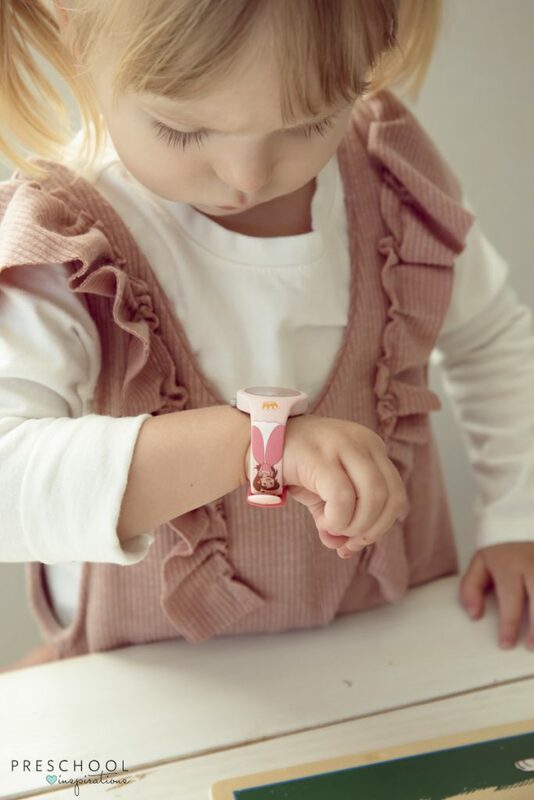 She sees her older brother and dad wearing a watch and wants to be included too. It will be a few more years before she completely understands how to read an analog clock, but I know that right now is a perfect time to get her excited to learn about time. In fact, for months I’ve been keeping my eye out for the perfect preschool and toddler watch for her. 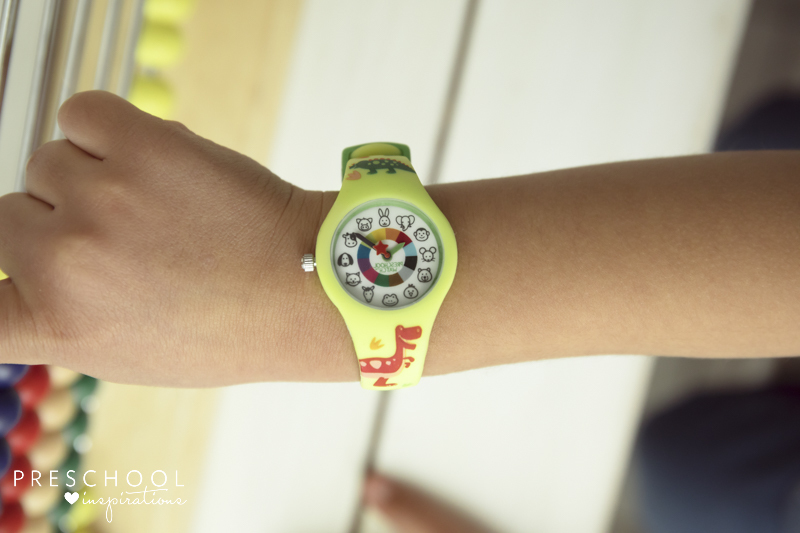 When I saw the kid clock and watches from Preschool Collection made just for her age, I knew they were on to something absolutely brilliant! This post is sponsored by Preschool Collection. All opinions are my own. 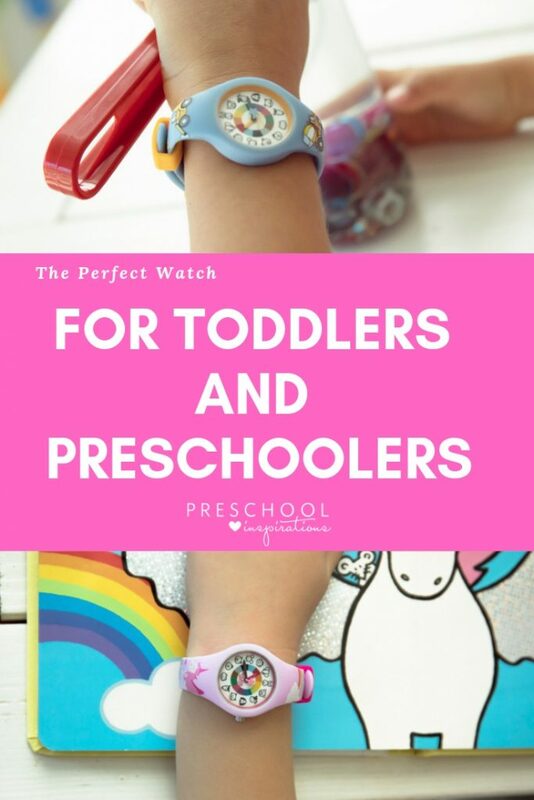 I love these preschool and toddler watches so much that I even added it to our kid gift ideas guide because it is one of my favorite items to gift to friends and family. My three-year-old daughter does not have a clue what it means when I say it is five o’clock, but she is starting to understand the basic concept of time through her routines. The key is to meet children where they are at and use tools that help them understand. Now, I have a new way to communicate what time it is with my daughter, and she loves it just as much as I do! I’ve used color to teach concepts to my preschool classes for years. It’s a simple way to help categorize or separate items quickly. 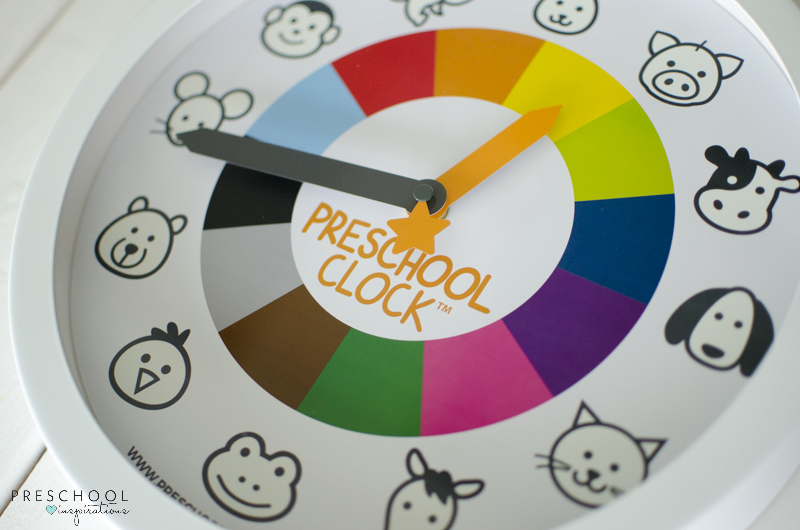 The first thing I noticed about the kid clock from Preschool Collection is that the clock hours were separated by colors. By using colored hours, children are able to quickly and easily start to understand the different times of day. Now, my daughter knows when she looks at her preschool clock that we eat lunch when the small hand is in the yellow section. And daddy comes home from work when the small hand is on dark green. Color coding our day with her preschool clock has been absolutely brilliant! Children learn best with symbols and visuals that they are familiar with. When my daughter saw the fun and adorable animal faces, she was delighted. And let’s be honest, children absolutely love animals. When I say a specific animal on my daughter’s watch, she loves that it becomes a puzzle for her to figure out. There is a second way that we love talking about the animals — as transitions! Transitions are those times between events or activities in the day. Those times where meltdowns are likely to start or where chaos can erupt. Anything that helps for a smooth transition is a win in my book! The animal symbols are a perfect way to talk about what’s coming up next in our day. It’s time to put your shoes on when the big hand is on the kitty. It’s time to leave the park when the big hand is on the bunny. Children thrive on routines and when we give them a visual way to see what’s coming up in their day, it helps them understand it much more easily. Plus, it helps me so that I am not nagging and repeating myself constantly. And there’s much less temper taming needed when we can walk children through these moments. I’m giving my mom and teacher approval for these preschool and toddler watches because not only are they absolutely beautiful, but they are educational at the same time. I also appreciate that they are high quality and perfectly sized for little hands. 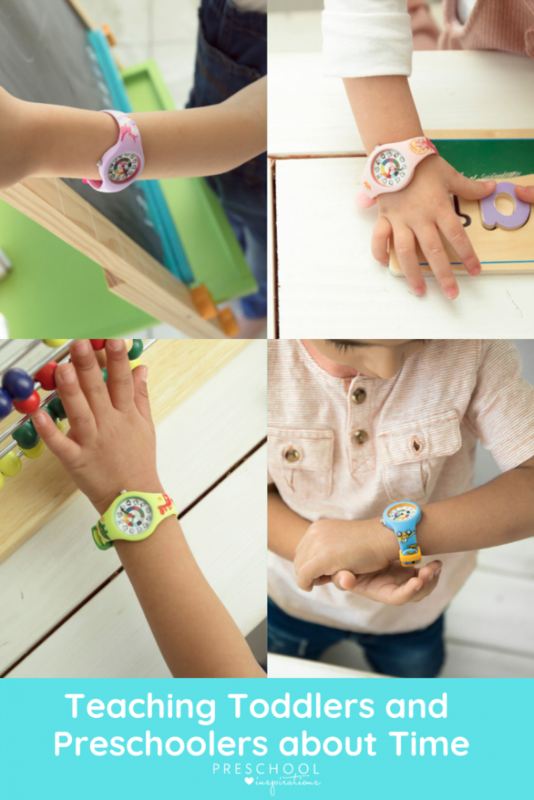 These kid watches were designed with lots of TLC by a fellow mom who knows that young children are busy and get into everything. You can even practice with this wallpaper for a smartphone. I always try to remember that children need multiple ways to learn. They need to hear it. They need to see it. They need to interact with it. And they need lots of practice… as well as our patience. And along with it, I’m sending you warm thoughts and happy vibes for smoother transitions and more enjoyable moments.